Posted on Sat, Mar 3, 2012 : 6:57 p.m.
Windy conditions early Saturday morning took down a tree which knocked a wire into the eastbound lane of Liberty Road between Dartmoor Road and Virginia Street. A police vehicle and DTE blocked off the road temporarily to traffic. About 2,500 DTE Energy customers remained without power in Washtenaw County Saturday evening following a windstorm Friday night and early Saturday morning. That number is down from about 16,000 that were left powerless in the county from winds that gusted to more than 50 mph. About 12,000 customers were without power as of 9:30 p.m. Saturday in DTE's service area in southeast Michigan. The bulk of those were in Oakland County, where 6,000 customers remained without power. About 2,000 were still in the dark in Wayne County. Some customers could be without power until sometime Monday, said DTE spokesman John Austerberry, though crews were expecting to restore a substantial number by the end of the day Saturday and most by the end of the day Sunday. “We knew this weather was coming, and we have a full complement of our DTE Energy crews as well as local contract crews working,” he said. Crews were working around the clock, DTE said. Extra crews were expected to arrive from neighboring utilities Saturday night. About 120,000 DTE customers lost power as a result of the windstorm, DTE said. 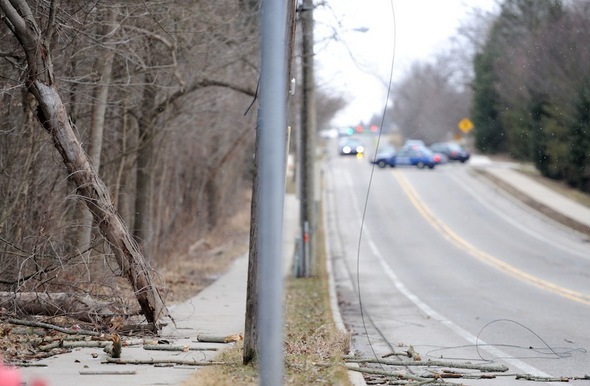 More than 300 power lines were knocked down, mostly by fallen tree limbs, DTE said. Farther west, Consumers Energy officials said about 76,000 customers throughout Lower Michigan were without power Saturday afternoon, down from about 112,000. DTE warned customers to stay at least 20 feet away from any downed wire and anything it’s in contact with and to keep children and pets away. Call DTE Energy at (800) 477-4747 to report any downed wired. The winds were part of a late winter storm that carried heavy, wet snow as well as the high winds across Michigan's Lower Peninsula. In Ann Arbor, the wind brought down power lines on Liberty Street near Dartmoor Road around 12:30 a.m., Ann Arbor police said. DTE crews had arrived by about 10 a.m. to deal with the wire, the Ann Arbor Fire Department said. The Washtenaw County sheriff's department received several reports of trees and limbs down overnight, especially in Dexter and Webster townships, a dispatcher said. Wires were also reported down in the Ypsilanti area, a dispatcher with Huron Valley Ambulance said. 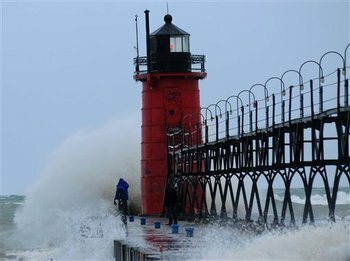 Waves from Lake Michigan crash into the South Haven Lighthouse Saturday. Meteorologist Amos Dodson of the National Weather Service's office in Oakland County's White Lake Township said winds gusted up to 55 mph Friday night and Saturday morning in some parts of the state. Northern areas saw snowfall ranging from 10 inches to more than 15 inches, spurring authorities Friday evening to declare roads impassable in some places, such as Benzie County. "We have blowing and drifting (snow) and it's super icy underneath from all this screwy weather we've been having," Sgt. Tony Harrington of the Michigan State Police post in Gaylord told the Petoskey News-Review Saturday. The Traverse City Record-Eagle reported it called its newspaper carriers off the roads Saturday morning and said subscribers who did not receive a newspaper would get one Sunday. Several area ski resorts reported power outages, dog sled races in Kalkaska were canceled and Northwestern Michigan College was closed Saturday. Dodson said the storm strengthened as it moved across the state. Although it was moving on to Canada Saturday, a gale warning remained on Lake Michigan until mid-afternoon. MLive.com reported that waves of eight to 12 feet were slamming Lake Michigan's shoreline, and in open water the waves could reach up to 24 feet. The storm was part of the same system that brought a string of deadly tornadoes through numerous states in the Midwest and South. The Associated Press contributed to this report. Contact Cindy Heflin at cindyheflin@annarbor.com or f734-623-2572 or follow her on Twitter. Mon, Mar 5, 2012 : 8:37 p.m.
putting everything under ground sounds great.it also sounds expensive,which means your rates go up.R U Ready 4 That? Sun, Mar 4, 2012 : 4:52 p.m.
Sun, Mar 4, 2012 : 3:01 p.m. Thanks for a great picture of that lighthouse. Wow! Over by Ecorse road? No power lose here. Great job DTE for keeping us in the light. Sun, Mar 4, 2012 : 2:15 a.m. I didn't know that windy weather could cause transformers to &quot;blow&quot; or &quot;explode&quot; before. If I could, I'd trade this weather event for snow deep enough for snowplows to clear, and have a snowplow hit one transformer to a building, causing a brownout. That kind of weather would have a much smaller effect on us than what we got last night did. A regular winter would have kept gravel roads much less muddy than this one did. Insects come back in spring as well as the birds. We usually think of spring as the start of tornado season, but it definitely started early this year. Sat, Mar 3, 2012 : 11:04 p.m. Sat, Mar 3, 2012 : 10:19 p.m.
just got the power back after 14+ hrs out. Sat, Mar 3, 2012 : 9:03 p.m. Sat, Mar 3, 2012 : 6:07 p.m. Thank all of you &quot;GREEN PEOPLE&quot; who involuntary are saving the planet by not having power! I wonder if DTE ever thought about charging you extra so that you feel like you are contributing to a lower carbon footprint? Sat, Mar 3, 2012 : 6 p.m.
what is up with the Ann Arbor police being absolute jerks about assisting the public concerning the damages and risks of the storm last night. my girlfriend was simply trying to drive to our house and it so happened that the street was blocked off. when she asked for information from the policeman on the scene, he called her stupid and asked her is she wanted to get electrocuted. why do cops have to constantly prove that they can't be smart enough to do deal with such things? i usually stand up for the police, having come from a family of cops, but jeez. Sun, Mar 4, 2012 : 4:45 p.m.
Having worked with police officers in a variety of capacities over the years, you will find that a certain number of them develop the &quot;us and them&quot; mentality. This comes from dealing with 20% of the people 90% of the time. They forget that most of us don't have immediate access to the information that they have, and they assume they are untouchable due to their status. It is unfortunate; most officers are able to overcome this but those that don't cast a pall on the whole department. Sat, Mar 3, 2012 : 6:06 p.m.
Was this the officer on Liberty west of the downed line? I had to talk with him as well asking for the best way to get to our place which was between him and the power company trucks. He was less than helpful and had quite the attitude. Sat, Mar 3, 2012 : 5:51 p.m. Sat, Mar 3, 2012 : 5:40 p.m. Winds gusting to 55,000 mph? Is that a cyclone? Don't be hard on the power companies, they are just trying to maintain that look and feel of 1927 Ann Arbor. Sat, Mar 3, 2012 : 5:46 p.m. I'm sure the Hysterical Commission is pleased. Sat, Mar 3, 2012 : 5:29 p.m.
Erm... no one noticed this? &quot;winds that were expected to gust up to 55,000 mph Friday night and early Saturday morning&quot; WE'RE ALL GONNA DIE!! =( Nice knowing y'all. Sat, Mar 3, 2012 : 6:29 p.m. Uh, yes, that was a typo, and it's been fixed. Thanks. Sat, Mar 3, 2012 : 5:38 p.m.
Yep. Universal Awareness... of imminent annihilation. Guess maybe the emergency siren test wasn't just a drill. See everyone at Blue Tractor for last rounds! Sat, Mar 3, 2012 : 5:32 p.m. Sat, Mar 3, 2012 : 5:27 p.m.
&quot;That's down form about 16,000 that were left powerless from winds that were expected to gust up to 55,000 mph Friday night and early Saturday morning.&quot; Wow! That is some wind. Would that be considered a Cat 250 storm? Were lucky anyone still has lights!!! Sat, Mar 3, 2012 : 5:09 p.m.
We haven't had an outage of more than a minute since the east coast blackout 10 years or so ago. It's not my grid, it's everyone's grid and it deserves to be rebuilt for this century and not the telegraph era. Customers pay for it, we deserve a better system instead of suffering outages from 30 mph winds and ice storms because the utility companies refuse to invest in the infrastructure. Sat, Mar 3, 2012 : 5:02 p.m.
Hey trueblue, the reason the power companies haven't been able invest in the grid is because of stupid politicians like obama and grahnmole mandating them to waiste that money on expensive inefficient green energy. The environmental extremists are forcing this once great country to live like a third world joke. They and their political stooges have blocked the new construction of nuclear energy plants while forcing existing coal fired plants to close. Just think of how nice it will be this summer when you're baking in your house because the grid collapses. In November we have the chance to stop the insanity! Sat, Mar 3, 2012 : 11:34 p.m.
Oh really? So it's the Obama Administration that started this downfall in Capitalist Enterprise - FOR THE LAST 30 YEARS??!! Come on, that ideological clap-trap doesn't fly, it started with REAGAN letting Corporate America become the Slacker of the Western World. Even the Clinton Administration was forced to go with the majority Republican Congress, so there's been NO impact from the Left Boogey Man you're blaming for everything. Obama: same story - he's going with Wall Street and the rest of Corporate America since Day One. Your &quot;grid collapses&quot; all happened because of the &quot;profit today, make excuses tomorrow&quot; financial irresponsibility of Corporate Elitism. Sat, Mar 3, 2012 : 3:54 p.m. Does anyone know what was causing the large blue flashes of light in the Packard / Carpenter / Washtenaw / Golfside area last night? At first they appeared to be lightning, but there was no thunder, and there were no thunderstorms in the area, and the flashes had a blue tint. Must have been something electrical. Sun, Mar 4, 2012 : 4:27 a.m. Sat, Mar 3, 2012 : 11:33 p.m.
A few years back lightning struck a transformer near where I live, and blue flashes of light radiated from that transformer. My surge protector was toast, as was my hard drive. Not much protects electronics from a direct hit. Sat, Mar 3, 2012 : 4:31 p.m. Sat, Mar 3, 2012 : 4:26 p.m. There were several transformer explosions in Ann Arbor last night. The scanner was going crazy with calls about downed trees and limbs and blown transformers. Sat, Mar 3, 2012 : 4:25 p.m.
Flashes like that typically come from transformers blowing out. Live better electrically - lol!! Sat, Mar 3, 2012 : 3:49 p.m. Surprised, actually, that power companies haven't thought to lobby for government supported improvement of their infrastructure. But no, in the good old U.S., companies are &quot;the best&quot; no matter what the condition of their capital equipment. I mean of course: a federal loan program, not another corporate welfare giveaway. But hey, we're paying for &quot;As Good As It Gets Here&quot; so we've got nothing to complain about, right? This wind storm: wasn't as strong as predicted. I stayed up 'til around 3 AM watching the wind speeds and the wind in Ann Arbor never hit 30 mph (more like 26 mph) and now it's down to 16 mph. This article doesn't mention the reason for the color coding of power outage areas: that's what tells you how long it will be before power is predicted to be restored. Some readers may not have been here in the early 90s when a strong thunder storm caused areas of Ann Arbor to be w/o power for 3 days or more. Power company crews needed that long to do a mass tree-trimming: showing that neglect was the real cause. That's about 20 years ago: I imagine those trees have grown new limbs over that time, eh? Sat, Mar 3, 2012 : 5:20 p.m.
Gentlemen: I stand corrected on the meaning of the color coding. Thank you. I was off the mark on that but &quot;on&quot; with my point. Ann Arbor has &quot;pockets&quot; wherein there are frequent outages - regardless of weather severity. It's always &quot;puzzled me&quot; because nothing ever seems to improve. Having flown in from the west coast last night I was up quite late as well. Yes, the sustained wind never got above 30 MPH, however there were multiple gusts to 45, with the highest I saw to 48 MPH. That is quite gusty. Also, the color codes on the DTE outage map refer to the number of people affected by the outage in a particular area. The color coding has nothing to do with the estimated restoration time. If you have a access to the map you can click on he colored area to obtain an estimated restoration time. I hope the people without power get it back soon. Stinks being without for sure. Sat, Mar 3, 2012 : 4:29 p.m.
Actually the colors are the number of customers affected. Sat, Mar 3, 2012 : 3:25 p.m.
All the more reason to put the grid and communication systems underground and get rid of the old, outdated, ugly and prone to fail in high wind and weather, wooden poles. Jobs, improved safety and fewer problems. Why won't the utility companies do this? Is it because it will eat into their short term profits? Sat, Mar 3, 2012 : 4:19 p.m. Sat, Mar 3, 2012 : 3:17 p.m. In NE AA, the power was going off and on every 3 - 5 minutes starting around 10:00 p.m. last night, and continued until at least 1:00 a.m., but the power was on this morning. Sun, Mar 4, 2012 : 4:25 a.m. Sat, Mar 3, 2012 : 3:14 p.m.
We're out until 9:30 - 11:30 pm tonight also. Thank God for our generator. We have water, furnace, freezer, refrigerator and even internet and wi-fi because of it. Life is good. Do miss a shower though. Sat, Mar 3, 2012 : 3:40 p.m.
Just saw 2 yellow power trucks cruise slowly down the road in front of the house! Good sign. Sat, Mar 3, 2012 : 3:38 p.m.
Mixmaster, yes, when you live in the country with a septic field and well water you are at the mercy of electricity. We used an oil lamp to light and heat the living room once before the generator. Kept all the doors to other rooms closed. Sat, Mar 3, 2012 : 3:27 p.m.
How ever did you survive without your generator? It must have been horrific. Sat, Mar 3, 2012 : 2:23 p.m.
How stupid is it that Consumers does not have a power outage map! Just curious about family members to the west. Did not want to call. Hope that answers why I care.